Special tours can be arranged and intrepid boaters can stop by when the open flag is flying. Donations are always appreciated. Esopus Meadows Lighthouse is a 501(c) 3 not for profit organization. from the Great Lawn of Mills Mansion or Mills Norrie State Park, also both in Staatsburgh, Dutchess County. The Esopus Meadows Lighthouse is one of the most picturesque and the only surviving wooden lighthouse on the Hudson River. Nicknamed the "Maid of the Meadows," it was built on the edge of the mud flats south of Port Ewen, where cattle once grazed. Rising sea levels have brought the levels of the tidal Hudson up as well. (Today the submerged flats are covered with thick beds of water chestnuts sheltering young striped bass and other fish, but remain a nautical risk.) On March 3, 1837 Congress provided $3,000 (originally approved in 1831) followed by an additional $3,000 on July 7, 1838 to complete the original Esopus lighthouse, a 34 by 20-foot stone house with an octagonal tower, built on a forty-one by fifty feet angular pier. The land was purchased from George Terpenning for a dollar. Four lamps and reflectors produced a fixed light, which were replaced by a sixth-order lens in 1854. A nearly identical lighthouse was also in use at Rondout Creek. Unfortunately, flood tides and ices floes severely weakened the building, making it “unfit for occupancy in the winter” by 1869. ​Accessible only by boat, life for a keeper and his family could be very lonely and on occasion even dangerous. Polishing the Fresnel lens and brass reflectors were daily tasks. The keeper also maintained a daily log of weather, significant events, and names and classes of ships passing on the river. In winter, when the river froze, keepers often took part time jobs on shore like ice cutting in the winter months. Manny Resendes was the last civilian light keeper before the Coast Guard took over operations in 1939. The last Coast Guard keepers were there until 1965. David Bennett, was actually stalked (unsuccessfully) over the ice in January of 1961 by a pack of ravenous wild dogs. In 1965 the lighthouse was officially closed, when an automated navigation aid was established on an adjacent metal tower. Eventually the Coast Guard planned to demolish the deteriorating lighthouse, until the Hudson River Valley Commission intervened with an eye towards preservation. Boards were placed over the windows and painted to look like curtains, including a black cat in an eastern window. 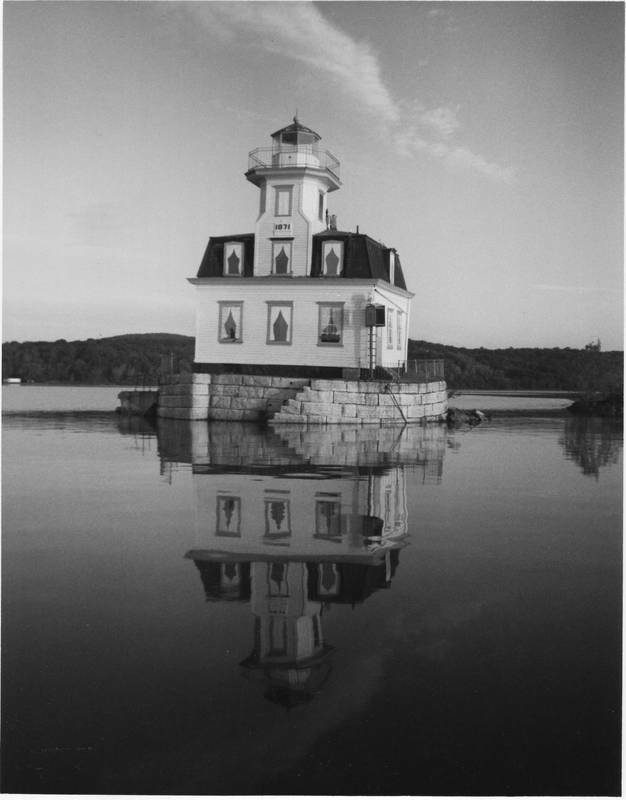 On May 29, 1979 the Esopus Meadows Lighthouse achieved recognition by the US National Register of Historic Places. ​In 1990 the Save Esopus Lighthouse Commission (SELC), under the direction of Arline Fitzpatrick (niece of Manny Resendes) and a number of dedicated volunteers leased the lighthouse from the United States Coast Guard to begin restoration. Having sustained major damage from vandals, flood tides, ice, and an occasional barge collision had eventually tilted the lighthouse on the deep (east) side of its granite foundation by 18 inches. The interior was cleaned, the exterior was repainted and the windows and roof were replaced. In 1997 SELC was reorganized under the leadership of Pat Ralston to continue these efforts. (It is safe to say that without the efforts of Pat, Esopus Meadows would not be standing today. She was instrumental in fighting for the right to carry on the restoration efforts when the General Services Administration wanted to pull the lease. She battled state and local naysayers who thought a woman couldn’t do it. She proved them wrong.) Large I-beams resting on hydraulic jacks were finally installed beneath the lighthouse in 2000, successfully leveling the building. A meticulous renovation has successively been completed, including recapping and repointing the stone pier, replastering the interior and repainting the interior and exterior, adding indoor trim work, refinishing interior doors, replacing missing shutters, rebuilding and restoring the staircase with polyurethane, installing indoor plumbing in the bathroom, adding period furniture, restoring the tower with a copper floor, and rewiring the lighthouse, installation of an alarm system and generator, battery bank, solar panel, and a new working light. In May, 2010, a floating dock was installed to facilitate the landing of larger tour vessels at the lighthouse. These many accomplishments were accorded significant public recognition, when in September of 2002 ownership was formally acquire as part of a pilot program of the National Historic Lighthouse Preservation Act of 2000 and on May 31, 2003 the Coast Guard reactivated the light. The Esopus Meadows Lighthouse was recognized as a museum under the New York State Regents in July of 2001 and in September 2002 the lighthouse stewardship was authoritatively granted by the General Services Administration to the newly chartered Esopus Meadows Lighthouse.